Accidents caused by DIY or hobbyist work lead to thousands of people ending up in the ER every single year. With the sharp increase in DIYers and hobbyists out there, it is very important to keep safety at the top of your priority list. So, before you power up the table saw or scurry up your aluminum ladder to fix the gutters, here are some DIY and Hobbyist safety tips that could help you prevent a serious accident or injury. This one is simple and should be the easiest thing in the world for any DIYer to implement. If you keep your work area clean and clear of clutter, you will be less likely to have an accident. Whether you are working in the shop or doing yard work, clean up the area before you start working. Besides the safety benefit, it is also much more enjoyable to work in a clean space! It’s simple. For every 4 feet of ladder height, move the base of the ladder an additional 1 foot from the wall it is resting on. Never use a ladder without reading all warnings and instructions that it came with. Also, make sure that the ladder you are using is the best ladder for the job. The last thing you want to do is put yourself high above the ground only to have to stretch even higher to reach the work area. If the ladder isn’t tall enough, skip the project until you have the proper equipment! Things like watches, rings, bracelets, necklaces, etc can be a real hazard when operating machinery or power tools. We hear a lot of talk about wearing baggy or loose clothes when operating power tools, but we rarely hear about accessories. If it dangles away from your body, take it off before working. No workshop should ever be without a proper first aid kit. Make sure it is stocked with bandages, anti-bacterial ointment, gauze, and other important items. Keep it easy to access as well. Wouldn’t be much good buried beneath a mountain of other stuff, would it? I know this one seems silly, but there are some very fashionable Safety Glasses out there that you will be more likely to actually use because you don’t feel like a doofus wearing them. The worst safety accessory you could possibly have is the one you won’t use. 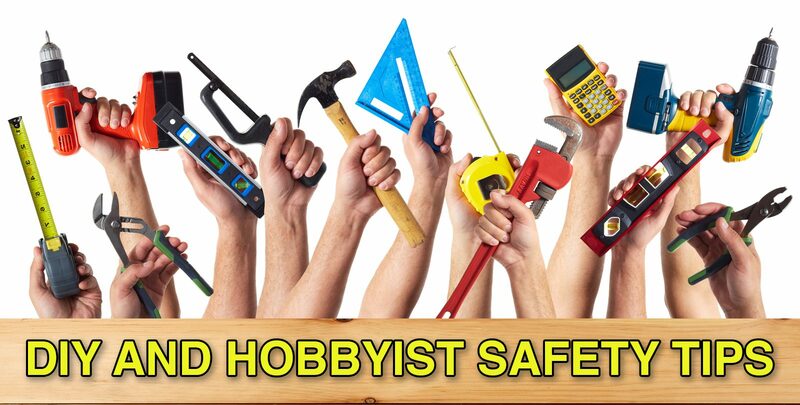 DIY and hobbyist safety precautions shouldn’t be any different from general safety precautions. Common sense goes a long way. A great rule to follow is that if something feels in any way unsafe with something you’re working on, stop and reassess the situation. Figure out a safer way of doing the job. With proper safety precautions, we urge everyone to continue tackling jobs around the house and yard!